Thanks largely to the impact of the last couple of America’s Cups, there’s a new generation of sailors who want to go foiling. Hydrofoils, to give them their full name, are the slender, curved underwater appendages that lift the hulls of the boat completely out of the water once it reaches a certain speed. It takes sailing to a new level of exhilaration, but – possibly again due to the America’s Cup – the impression is it costs an arm and a leg to get into a boat capable of doing it. 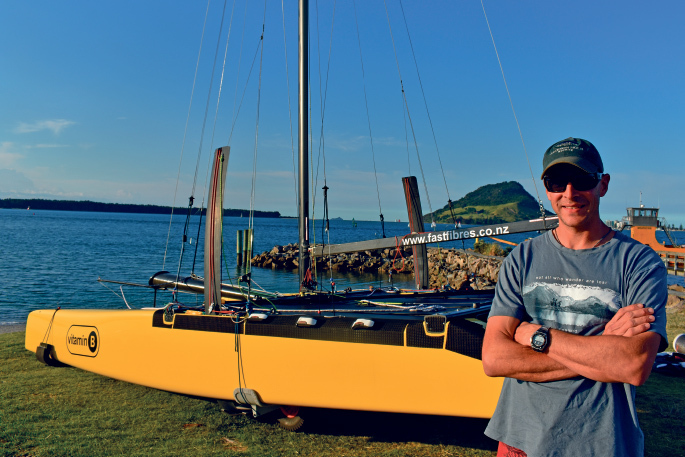 That’s an issue Tauranga’s Bruce Beca, driving force behind composite-specialist design and manufacturing outfit Fast Fibres, has put his considerable boatbuilding, designing, and sailing experience to work to resolve. His solution is the H20, a 20-foot hydrofoiling catamaran which can be largely home-built, and thus coming in at a price that leaves its competitors trailing in its wake. “If you’re keen to undertake sailing of this kind at this level,” says Bruce, “you’ve got a couple of options to buy them brand new out of Europe – albeit they’re manufactured in Asia – but they’re going to cost you somewhere between $NZ65,000 – 70,000. But for someone handy with tools, and possessing just a basic level of skills, DIYing an H20 is totally do-able, with Bruce supplying the trickier components and the detailed instruction book he’s putting together. “It breaks it down, keeps it real simple. You build your basic hulls, and you do the assembly, and I supply foils, rudders, rudder stocks, beams, masts - as much or as little as the client wants. Fast Fibres can supply a fully-built ready-to-fly H20 if that’s what the buyer wants, or to save serious money – and that’s what this project is all about – virtually everything can be home-built. “The mast, booms, gennaker sprit, beams even, can all be made DIY,” says Bruce. Sailing a boat like the H20 is not for the beginner, especially in foiling mode. But despite that, it’s a design that looks after its crew, Bruce says. “We’ve only had one capsize, and it was only because they had a gear breakage. And had a bit of a rookie crew on board. Easy it may be, but it still takes some learning, says the born-and-bred Bay native who completed his apprenticeship in Auckland before heading off for a seven-year OE. He returned to Tauranga - “the coolest place on Earth” - he declares, to become an Open 60’ construction manager, for Southern Ocean Marine, while on the side establishing his specialist composites operation, which has now become his primary focus. He’s been sailing most of his life, says Bruce, but never on a foiling boat like the H20, so even he’s had to learn to sail all over again. “I felt like a bit of a beginner, but it didn’t ever feel like the learning curve was too steep. What about the ultimate nightmare of foiling sailors, as Team New Zealand discovered on the waters of Bermuda’s Great Sound, the tendency of these beasts to fall off the foils and pitch-pole? Despite how tolerant his H20 is on its foils, Bruce recognises there are those put off by the mishaps of the America’s Cup boats, and the technical ability required to sail them, and just don’t want to take sailing to its extremes. So he’s designed the boat to sail well in its alter ego as a regular catamaran. While the instruction book remains a work in progress, due to the pressure of boatbuilding and other work on Bruce’s shoulders, a buyer could start building their H20 now, he says. Taming the beast, once it’s in the water and foiling, may remain a challenge, but at least finding the budget to realise the dream has become so much more of a realistic possibility, thanks to Bruce’s innovative thinking.